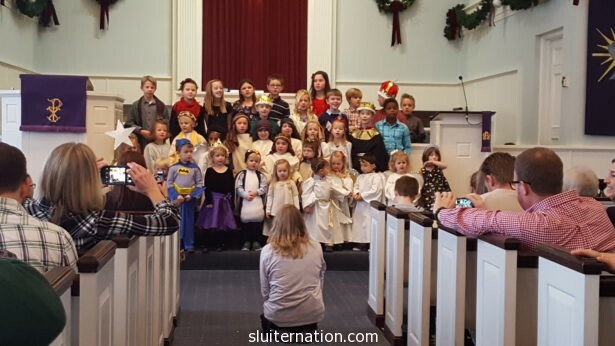 This past Sunday morning, our church had their annual Christmas service that was led by the youth and young children of our church. I love this service. It takes place during our normal 10am Sunday morning church service time rather than make it separate. It follows the liturgy of our regular morning service as well, but it is all led by the children. Naturally, Eddie loves this service too because he loves to participate and be in front of people. He has always sung in the children’s choir, and last year he had a part as one of the shepherds. 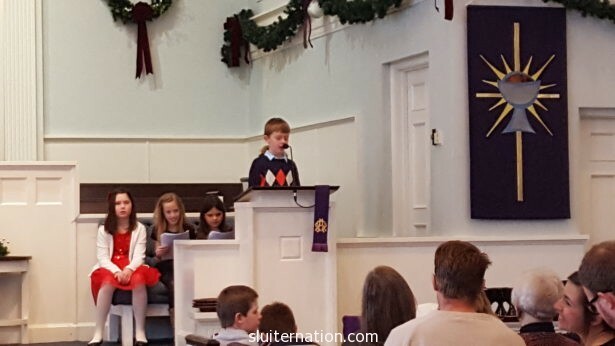 This year, he was very excited to join the mostly 4th and 5th graders as one of the narrators of the Christmas story. He read so clearly and was so brave. My heart filled with pride and love for this little boy who knows he has the gift of reading and sharing with others. It’s such an honor to be his mother and watch as our church family helps him nurture these talents. Charlie is a much different little boy than his older brother. He is quiet–even a bit shy. He does not like to be in front of church at all. Even for the Children’s Message when the little kids go to the front to sit on the floor for a little pow wow during church. No one can really even see the kids, but he won’t do it. In Sunday school though, just like in preschool, he is very attentive. He loves to sing and because he is so retentive, he learns all the songs and even the motions very quickly. But he doesn’t like to stand up in front of church or have people look at him while he does it. When the children were told they were going to sing their Christmas songs in front of church and get to wear costumes, Charlie’s first reaction was, “I will be Batman!” He had been Batman for Halloween and he fell in love with the costume. It gave him such confidence to join in with other kids when he was wearing it, and even walk right up to houses to trick or treat–something he didn’t like to do in the years before. We told him that Batman wasn’t really a Christmas costume. That the costumes available would probably be angels and shepherds and sheep and maybe a cow or donkey. He was resolute that he was going to be Batman. On the Saturday before the program, we showed up to church for rehearsal. Eddie felt confident of his reading, but Charlie clung to my leg and didn’t want to join the other kids. We went over to look at the available costumes and he shook his head at each angel costume, shepherd’s cloak, or fluffy sheep footies. He wanted to be Batman. I finally told him it was Ok if he didn’t want to wear any of the costumes. I wouldn’t make him. He went off with the other kids to the sanctuary for practice and I went downstairs to the church kitchen to help prepare for the Christmas Tea that was going to be served after the program on Sunday. When I came back up, I found out that Charlie had refused to practice since he wasn’t Batman. Sunday morning came. Eddie got all dressed up in his Sunday best, and Charlie talked about how he really wanted to sing with the kids. He wanted to wear a costume. His Batman costume. He couldn’t sing if he didn’t wear his Batman costume. He brought smiles to many faces. No one turned up their nose or made any rude comments. Everyone loved his costume because they all love my Charlie. The costume wasn’t worn for attention or because Charlie was trying to be silly. He wore it because it gave him confidence. He felt brave. He stood up with the kids and sang the songs, and twirled his ribbon, and did a fabulous job. And he knew he was loved. That was amazing! Thank you for the smile! I love everything about this! Way to go, Mama. Charlie is lucky to have you. Parenting is full of battles to be won and lost along the way. Batman at the Christmas Pageant is not one of them.